Our portfolio companies are driving innovation and opening access to the most promising opportunities for all New Yorkers. We work with them to provide funding and other resources that support entrepreneurship and spur job creation, including in New York’s most disadvantaged communities. 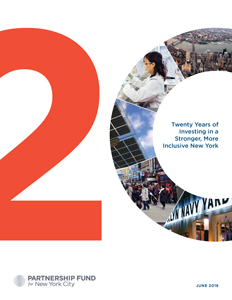 Founded by Henry Kravis in 1996 and capitalized by New York’s leaders of business and finance, our mission is to mobilize our investors’ resources—their money, time and influence—to create jobs, spur new business creation and to expand opportunities for all of the city’s residents and neighborhoods. We invest exclusively in New York City-based ventures—both for-profit and non-profit—with an overall job creation priority. As an “evergreen” fund, realized gains are continuously reinvested. Since inception, the Fund has invested in excess of $160 million. The city’s business leaders help us identify and support promising entrepreneurs, with hundreds of business leaders contributing annually on our sector advisory boards, investment evaluation teams and as judges and mentors in our programs. The Partnership Fund Board is led by Co-Chairmen, Charles R. Kaye and Tarek Sherif. Maria Gotsch, President and CEO leads our team. Two decades of accomplishments by the $160 million civic fund that was established in 1997 and capitalized by corporate and individual contributions from the city’s business leaders. 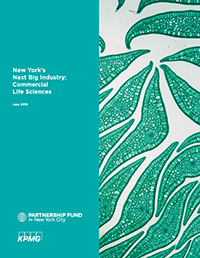 A new report on New York’s life sciences industry and its potential for significant growth in the coming years. Our enterprise tech programs leverage New York City’s concentration of corporate customers to accelerate growth of early and growth stage tech companies in key sectors.